Geographic Range: Brook trout (Salvelinus fontinalis) are the only trout native to much of the eastern United States. They have inhabited the East’s coldwater streams and lakes ever since the retreat of the continental glaciers across New York and New England, and they have thrived in the ancient valleys of the Appalachians for the last several million years. Arguably the most beautiful freshwater fish, brook trout survive in only the coldest and cleanest water. In fact, brook trout serve as indicators of the health of the watersheds they inhabit. Strong wild brook trout populations demonstrate that a stream or river ecosystem is healthy and that water quality is excellent. A decline in brook trout populations can serve as an early warning that the health of an entire system is at risk. Brook trout are a hearty, cold-water species that can inhabit a wide variety of environments. They can be found in small streams, rivers, beaver ponds, and large lakes. Some states have anadromous populations, called salters that spend most of their adult life in salt water and return to fresh only to spawn. Although they are a cold-water species, they can tolerate a large range of temperatures from 0 – 22°C, but prefer 13 - 18°C. Movement/Migration: Movements inshore and offshore are related to spawning behavior and water temperature. If the habitat becomes too warm (>22ºC), brook trout will migrate to seek refuge. Deep pools and tributaries are the most common sanctuaries. If the river habitat is suitable for brook trout and they do not experience any stressors throughout the year, they tend not to travel large distances. Most of the populations existing in larger rivers act this way. They do not move until the fall at the onset of spawning. Even then, if the river has adequate habitat diversity, they tend not to travel large distances. Other populations have adapted to various river conditions. They travel very large distances (>120 km) in search of thermal refuge and/or spawning habitat. Some spawn in the main stem of rivers, while others utilize tributaries. Lucastrine (lake) populations move around the lake throughout the year in search of forage and spawning. Spawning: Spawning occurs sometime between September and October and is dependent on water temperature. Maturity is usually attained at age 2 but can occur at age 1 in small streams where the trout tend to remain small due to the available habitat. Females will make a depression in the gravel substrate using their tail. This depression is called a redd, or nest. She will defend her redd during construction and pair up with the dominant male, who will also play defense with her. Often times this defense is to push off precocial subdominant males. When she has completed construction, the male and female join together side by side and release eggs and milt, sperm, simultaneously. The free floating, non-adhesive eggs fall into the depression in the substrate. She then moves slightly upstream and begins the process all over again. She continues to build redds until she is void of eggs, each time moving upstream so the sediment from construction falls onto the previously built redd and affords those eggs protection. She then migrates to deeper water for the winter. The males do the same. Both males and females are not monogamous and will mate several times before moving to winter habitat. The males tend to arrive later to the spawning area than the females and usually leave earlier. The fry tend to emerge sometime between February and April, again depending on water temperatures. They will inhabit areas that provide protection and forage, such as vegetated areas and pockets in between larger substrate until they are large enough to fend for themselves. 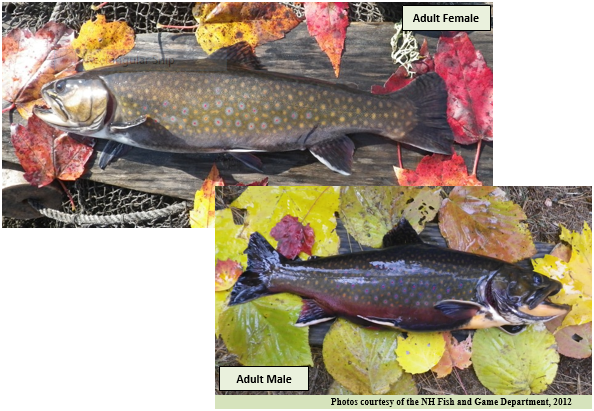 Habitat Use: Brook trout are specific in their habitat selection at different stages of their life. Habitat preference varies depending on other factors, such as temperature, dissolved oxygen, and food availability. Brook trout eggs are usually found in gravel depressions, influenced by groundwater. Stream flow in these areas is usually low to moderate. Larvae tend to seek out protected zones, which usually consist of pockets under and in between rocks and highly vegetated areas. Nursery habitat for larvae and juveniles includes littoral and sublittoral zones in lakes and ponds, where submerged aquatic vegetation and macroalgal beds provide important nursery habitat. Juveniles rely on several different substrate and habitat types, including cobble and boulder stream bottoms, small undercut banks and pools. As they become adults, they tend to start choosing habitats that fit their size and afford protection from predators (e.g. deeper pools and larger undercut banks that provide). Lake populations do the same, moving deep to afford protection from predators and thermal stress. Both stream and lake populations move throughout various habitats in search of food. From 2006 through 2013, the Eastern Brook Trout Joint Venture has supported 76 projects in 14 states that enhance 200 miles of in-stream habitat and 157 acres of lentic habitat, restore 14 miles and 341 acres of riparian habitat, and reconnect 205 miles of stream habitat by removing 78 fish passage barriers. Funding for these projects was provided by the U.S. Fish and Wildlife Service ($2.9 million) and 366 project partners ($14.5 million). Information on each of the projects is listed below by year funded. The estimated socioeconomic benefit resulting from these projects is $232 million. Click to view Projects. The Southeast Aquatic Resources Partnership has also funded project to benefit this species. This project removed 11 remnant log drive dams and added large woody material to restore fish passage, stream connectivity and natural stream processes that passively restored cold water habitat in the tributaries of the Machias River. A total of 27.2 miles of stream upstream of the dam sites was affected by the project. Project text provided in part by Steven D. Koenig, Project SHARE. The Cross Fork subwatershed, part of the Kettle Creek drainage, is considered one of the best of the best brook trout habitat areas in Pennsylvania. The subwatershed, almost entirely contained within the Susquehannock State Forest and thus protected in perpetuity, is widely renowned as a brook trout destination fishery. The watershed is home to a network of dirt and gravel roads where improper road profiles, inadequate draining, and multiple stream crossings have accelerated erosion and transport of sediment to the streams. This project selected and implemented high priority projects that focused on dirt and gravel road improvements, streambank stabilization, riparian buffer restoration, and brook trout habitat expansion. Project text provided by Amy Wolfe, Trout Unlimited. This project, funded in FY2013 by the Service through Hurricane Sandy Recovery Funding, removed two existing fish passage obstructions and restored connectivity for brook trout in Cresskill Brook in Bergen County, New Jersey. Project text provided by Peter Jaran, PE, Equity Environmental Engineering, LLC. Red Brook is a small, spring fed, 4.5-mile-long trout stream that empties into Buttermilk Bay, not far from the Cape Cod Canal. This stream has been impacted by cranberry bog farms since the mid 1800’s. Between 2006 and 2009, four dams were removed from Red Brook in the Lyman Reserve by the Massachusetts Division of Ecological Restoration, TU and TTOR, along with extensive habitat restoration. Herring, eels and brook trout now swim an unobstructed Red Brook for the first time in 150 years. Project text provided by Sea Run Brook Trout Coalition. This project, funded in 2011, located in South Berwick, ME will restore approximately 800 feet of habitat for diadromous fish species and enhance approximately 4.3 miles of habitat in Shoreys Brook. The Great Works Regional Land Trust completely removed a partially‐breached dam and restored the streambed to its approximate original condition in 2011, and is coordinating with the Maine Department of Transportation to replace a failing perched culvert with an open‐arch culvert in the summer of 2012. Project text provided by Great Works Regional Land Trust. Drought and stressed habitat conditions exacerbated natural competition for food and space between brook trout and rainbow trout in several creeks in the Cherokee National Forest. Both species, popular with anglers, were declining due to drought in recent years. By improving or restoring habitats, and removing rainbow trout from certain areas, both species can more easily thrive in the forest. The brook trout is the most common state species in the United States and is recognized in 8 of the 27 states encompassed by the Whitewater to Bluewater Project.